Research powers everything we do. Our Research Team takes a rigorous approach that is constantly evolving and up-to-date, providing your organization with personalized insights on current and future trends. We publish more quality research – including at least two new releases each week – than any research and analyst firm in the industry. Our elite group of analysts centers its research on understanding how business performance can be improved. This results in practical, actionable research that empowers executives to make the best strategic decisions about implementing effective strategies, efficient processes, and leading technologies across the following functions - Learning and Development, Talent Management, Leadership Development, Talent Acquisition and Workforce Management. 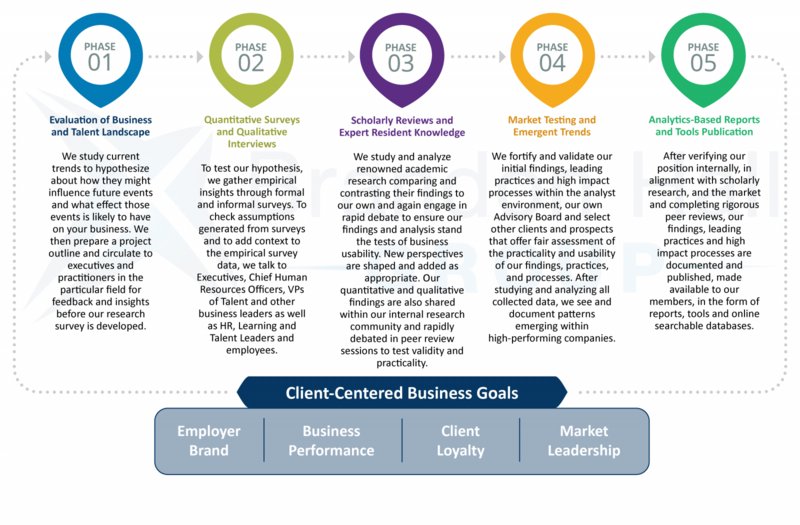 Our proprietary research methodology allows us to envision future-state human capital practices in the context of a complex, evolving and global business landscape. Based on more than 25 years of translating data into action, the success of our five-phase methodology lies in analytics-based benchmarks, models, frameworks, documents, tools and other pragmatic, actionable research assets. Together they accelerate business results and empower excellence in organizations.